I’m always looking for something healthy to eat and drink, but when you are on a weightloss program things get a lot tougher. 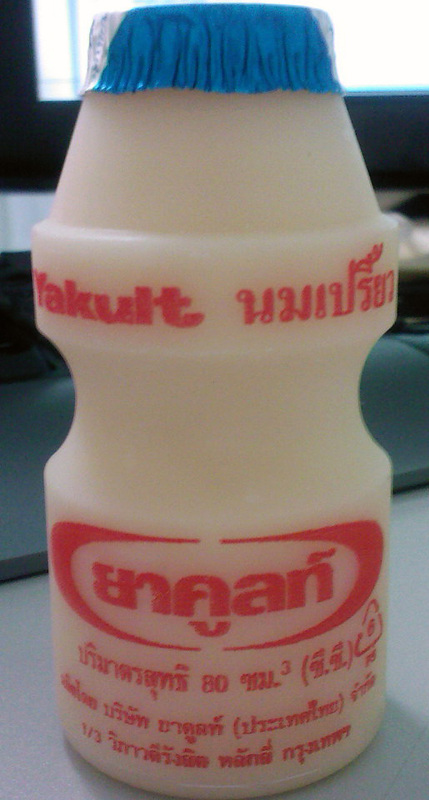 I love drinking Yakult. If you don’t know what it is, it is probiotic drink made by fermenting skimmed milk with a special strain of Lactobacillus. This is supposedly a very healthy drink that is supposed to regulate your bowel movements and help you in a zillion ways. It’s an awesome drink that refreshes me every time I drink it. I love it. The funniest thing is that it is only sold by direct sales. It’s not easily found in stores and you have to find it from one of the Yakult ladies dressed in their brown uniform with a brown cap. Originally from Japan, this drink is now sold worldwide. However, if you are on a diet, I have to tell you this. BEWARE. Yakult is extremely high in sugar with roughly 17 grams of sugar in a 100g serving!! That’s already around 6% of your suggested daily intake. Sugar, as I’ve mentioned before slows down your metabolism. If you have it first thing in the morning, it does no good for one who is trying to lose weight. Oh, it’s also roughly 75 calories, which is relatively high for such a small bottle. I always had two at a time! Some also claim that to really get all the added benefits of Lactobacillus, you need to drink a lot more than that one bottle. I have no scientific evidence, so you will have to do your own research. Just note, beware of the sugar in Yakult!